Kurds Put Their Independence Dreams On Hold : Parallels When Iraq was rapidly fracturing this summer, the Kurds started talking about independence that they've been seeking for a century. But now, the priority seems to be battling the Islamic State. Iraqi Kurdish peshmerga fighters arrive Saturday in Sinjar in northern Iraq, where they have made gains against the Islamic State. The Kurds were talking about independence this summer, but now appear focused on fighting the Islamic State. Soon after Kurdish peshmerga fighters broke a siege by Islamic State extremists around Mount Sinjar in northern Iraq, Kurdish television reporters arrived to broadcast the riotous celebrations. This was the largest gain by the Kurds against Islamist militants since August, when Islamic State fighters, also known as ISIS, threatened Irbil, the capital of the Kurdistan Regional Government. 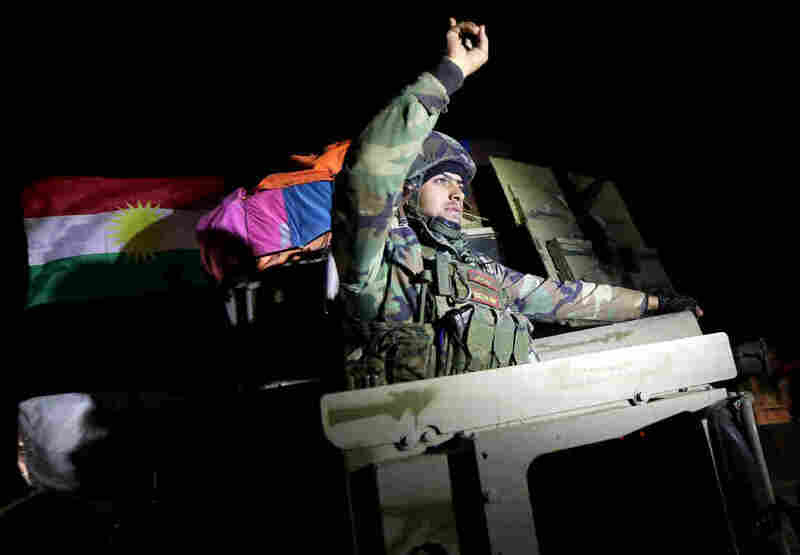 The Islamic State advances toward Irbil were halted after the Obama administration ordered airstrikes to aid peshmerga fighters in the rescue of Iraqi Kurdistan, the stable part of an unstable Iraq. So far, so good. But the recent hard-fought success in Sinjar is only an incremental step. There is still more fighting ahead. Mosul, Iraq's second-largest city, is still under ISIS control, dangerously close to the Kurdish capital. "You cannot sleep if ISIS is your neighbor. You will have many nightmares," says Fuad Hussein, the chief of staff to the Kurdish regional presidency, speaking at his office in Irbil. "The reality is now different. We are facing a threat." The rapid advance of ISIS this summer and the group's staying power in many parts of northern and central Iraq have altered Kurdish calculations and stalled the drive for Kurdish independence. According to top Kurdish officials and regional analysts, the consensus is that Kurds are "dialing back" their political aspirations for now. Back in June, the Kurds appeared poised to make a major push for independence. It's been a Kurdish goal for generations, and suddenly events seemed to be playing out to their advantage. The Iraqi army demonstrated its weakness when it evaporated in the face of an ISIS advance on Mosul. The Kurdish peshmerga also gained control of Kirkuk when the Iraqi security forces disappeared from that oil-rich city. The Kurds see Kirkuk as their historic capital, a claim long disputed by Baghdad and Kirkuk's Arab residents. 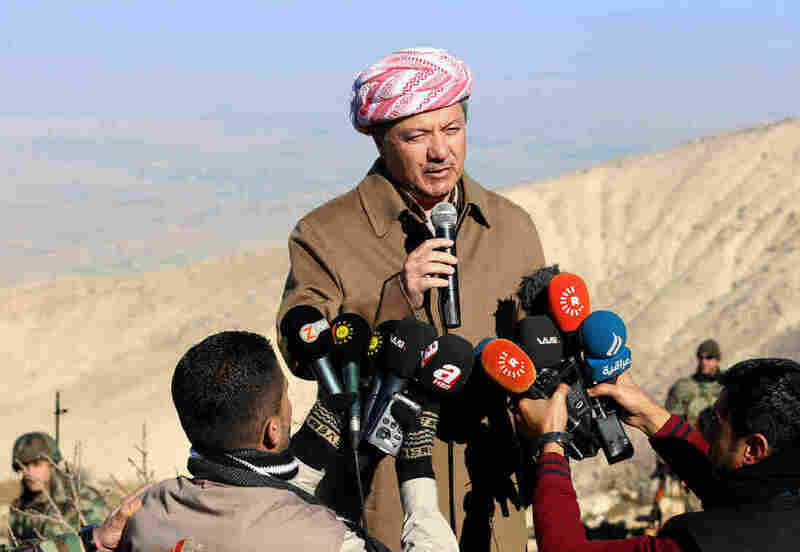 In July, the president of the Kurdistan Regional Government, Massoud Barzani, pledged to hold an independence referendum within a few months, and many Kurds in Irbil declared they were eager for a divorce from Iraq. "I don't feel I am Iraqi," Ahmed Amin told me back in June, speaking at a park in Irbil. In those first weeks of the ISIS expansion, the "war next door" seemed far away. Amin, a translator for a Western oil company, was out for a stroll at dusk with his wife and young son. "We are in a safe place," he said, "it's time to be a separate country," a sentiment shared by many Kurds. But when I made a recent trip to Irbil, it was clear the mood had changed. "The Kurdish leadership are realists," Fuad Hussein says when asked if the independence drive is on hold. Over the summer, Hussein went to Washington to lobby U.S. officials to back Kurdish independence, as Iraq seemed on the brink of fracture. "Now the priority is to defend our country and defend our society. The threat of ISIS is a threat to our lives," he says. A unified Iraq is the priority for now, says Akeel Abbas, a professor who teaches political science at the American University in Suleimaniya, a mostly Kurdish city in northern Iraq. He sees the change in his students since June. "Students would tell me, 'You come back in two or three months, and we will have independence,' " he says. "There was a big expectation. Now, the bubble has burst." The ISIS threat is one important drag on the Kurds' independence bid, but it's not the only factor. The Kurds cannot afford to go it alone right now. In the past few months, collapsing oil prices have forced a change in calculations. Patrick Osgood, the Kurdistan bureau chief for the Iraq Oil Report, a Web-based news service, calls it "the mathematics of when the KRG can exit Iraq." The KRG also has been burdened by dramatic costs for more than a million internally displaced Iraqis and a quarter-million Syrian refugees who have come to Kurdistan for safety. "The numbers weigh in favor of doing a deal within the federal system, " says Osgood. In early December, the Kurdistan Regional Government and Baghdad agreed to settle a long-running dispute over oil sales and salary payments. For more than a year, Baghdad had suspended paying KRG salaries. It was to punish independent Kurdish oil exports to Turkey. On Dec. 2, Iraq's new prime minister, Haider al-Abadi, agreed to pay peshmerga salaries out of the central budget. "This deal will keep the KRG at the table for longer than if it was just about oil," says Osgood. For the Kurds, there are also external pressures. Neighbors Iran and Turkey have still not warmed to an independence bid, fearing that their own Kurdish population would see it as an opening to push for greater autonomy. Nor has Washington softened. The Obama administration often praises the Kurdistan Regional Government as a strong and reliable U.S. ally, but insists on sending all military supplies through Baghdad as a firm signal that a united Iraq remains U.S. policy. The Kurds are fighting ISIS because of disastrous policies in Baghdad, says Hemin Hawrami, the head of the Kurdish Democratic Party's foreign relations office and a prominent voice in Kurdish politics. 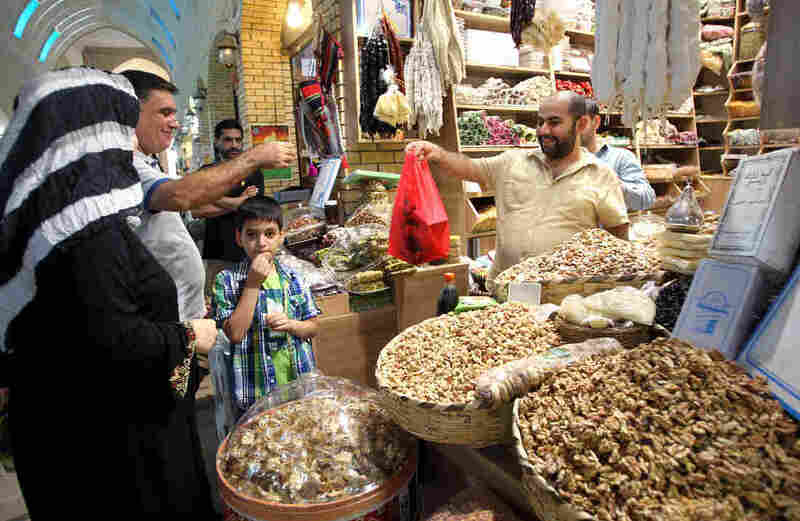 "Iraq is a failed state," he says, adding, "We are paying the price for their failure, really." Despite the dismal assessment, he adds that he welcomes the new politics of Baghdad. He praises the new prime minister. He talks about "one last chance" for a unified country. He also acknowledges that the ISIS threat will require the resources of the Iraqi state. "We need Iraq to be strong enough to help us help them in defeating ISIS," he says. And this is why the Kurds now talk more about defeating ISIS than about going for independence. "The direction of travel is set; we are just arguing about the rate of travel, " says analyst Patrick Osgood. Kurdish aspirations may be on hold, but the dream hasn't gone away.